The month of June brings about the summer solstice, the first day of summer vacation, and (to the delight of kitchen retailers everywhere) wedding season -- which, in turn, means kitchenware sales and wedding registry promotions galore. A popular gift item this year is kitchen knife sets, replacing earlier trends of silverware pattern sets. "A really good chef's knife is the power tool for the kitchen," replied one Chicago bride during the WSJ interview. 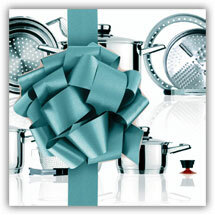 Small kitchen appliances in general have stood the test of time on wedding registries. In years past, electric skillets and broilers were more popular. Nowadays, the popularity has shifted to appliances that run well and have several technological features worth boasting about. One such example is a single-serving coffeemaker. Consumer Reports tested and approved models made by Cuisinart, Kalorik, and Hamilton Beach. Each coffeemaker retails at approximately $100. The Cuisinart Food Processor has topped wedding registry lists since its invention in the '70s, and its $200 model is also backed with a Consumer Reports approval. Cookware has also been a registry staple for decades, although the terminology evolved from simply "pots and pans" to being fully well-rounded cookware sets of griddles, saute pans, skillets, as well as a saucepan or two. The choices these days are exponential. Pots and pans were typically made out of aluminum. Now, cookware can be found in cast iron, non-stick, copper, diamond-coated, or eco-friendly ceramic materials, just to name a few. One trend that Consumer Reports noted as "disturbing" is the continual rise of gift cards. This is because they often go unused or unclaimed. Their advice is to choose kitchenwares wisely and pick the best ones out there -- you never know what you might get, and you want something with a great warranty that will last for years and years.